Do You Get It? Really, Really Get It? I absolutely love that song, it has to be one of my favorites. I think we often forget how God loves us, and that is where I think we should we start this morning. When I sing this song and think about how He loves me, I can’t help but swell up with emotion. What if we lived every moment of our lives like that? My favorite part of the song is when verse two ends and we return to the chorus. We sang, “I don’t have time to maintain these regrets when I think about the way He loves.” I don’t focus on my mistakes, I am consumed by His love. I think we lose sight of the love God has for us. We forget the height, depth, and width of His love. We take it for granted. In the Ephesians passage, Paul is praying for the early church, that they would be able to fully comprehend God’s love. And this is where God has me right now. I need to pray this very thing for myself and for our church daily. And honestly, I have never even thought to pray like that. You know how I know we are missing it? If we fully understood or appreciated the Love God has for us, our lives would be radically different than they are. Some may say that James’ teaching here contradicts the teachings of Paul that we are saved through faith alone, not by works, but that’s not the case. There were essentially two pendulums to the faith/works debate and both men where trying to argue against each side. When Paul talked about works, he was addressing legalism. James is referring to the works that are a natural outpour of faith in Christ. Some people were twisting faith in Christ to say that no expression of works was necessary. I think many Christians in our culture would swing to this side of the pendulum, which is why I’m addressing it. We are quick to argue that salvation comes through faith alone, and usually want to stop right there. But as James points out, faith alone, without outward expression, is dead, useless, and incomplete. Love and action work together. As I prepared this sermon, I thought of a little friend we made this year in Mexico. Her name is Emily, and we think she has bad allergies and maybe asthma. She has had trouble breathing and has even passed out a couple of times. One time for several minutes. While visiting with her and her family, they showed us the medicine they needed to get for her. It’s Singulair, but they didn’t have the money. They knew their little girl could pass out one of day and never wake up. But there was nothing they could do. If Renee and I had said, “We hope you find the money,” we would have been useless. Jesus told us to love others as we love ourselves, and if it had been our children in need of medicine, we would do whatever it took to get it for them. We knew what we needed to do. It meant we would have less cash to buy junk at the market. We gave them the money the next morning and that afternoon they brought us the receipt and showed us the medicine. Before we left, our entire team had pitched in and Emily had four months worth of life-saving medicine. This is love followed by action. It is useful; it is helpful. If our team would have known about the need, had the power to help, and not helped it would have been useless right? So is our faith without deeds–when people say they have faith but don’t back it up with their action. Is that you? Are you guilty of claiming to have Christ in your life, but not really living it? Click here to listen to the sermon in its entirety. Joe Nelson holds a B.A. in psychology from Southwest Baptist and a Masters in Counseling from Midwestern Baptist Theological Seminary. He currently serves as youth pastor at Northland Baptist Church in Kansas City, MO. This entry was posted in Let's Get Real and tagged action, faith without deeds, How He Loves Us, love. Bookmark the permalink. Thank you for your thought. How can we measure an infinite God? Our tiny finite minds can’t grasp but only in part. I look to children when I need a glisp of God’ love. My daughter shared how her two oldest are catching on to the love of God. Last week was VBS. She shared with the Bible School how it takes $27 to translate each verse into another language so that the boys and girls could understand who Jesus is and learn so the spirit of God can bring them into eternity one day. She set a modest goal of $200 for the week. God’ Spirit moved the hearts of each of these little precious ones as they didn’t make the goal for the week. No, reaching another boy and girl caused these kids to bring in their personal piggy banks, redirected their thoughts away from ‘all about me’, to kids they didn’t know. $700 the first day, then $300, then $500, so the week was over $1400, brought in by the kids in love, not seeing, not knowing, but trusting in faith to God. Isn’t this what I need to do. Take my eyes off my petty needs and open to the vast interconnections of God’ kingdom in unknowing love; to taste a sliver of that height, depth, so that others might live. May God direct my heart this day to knowingly step out of myself and free give in to His love. Wow, Terry, great story. I think you should turn that into an article. beautiful thoughts, Jennifer. Sometimes I forget how much God loves us, so this is a good reminder. You have a beautiful family. I’m expecting my second boy, so my husband and I will have two kiddos soon. Looking forward to meeting you at the ACFW conference. thank, Mel, but that’s not my family. 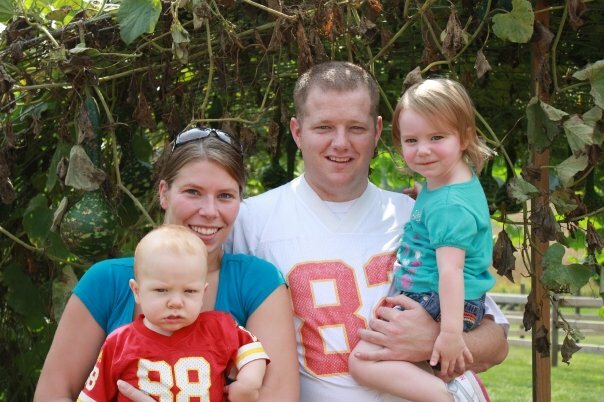 That’s actually a photo of our youth pastor and his family. I should have clarified. Sorry.